Front page of the bookmark. Click on the image for the original. During COMMITTED’s visit to Thangpalkot earlier this month, we presided over the Star Reader Program functions at the schools in the area. The program was instituted to encourage the children to read after COMMITTED helped build libraries in every single one of the schools. As per the program, students who read the most in their class and the ones who read the most in the school were recognised with prizes…of books! We discovered children who had read over 50 books in the past year–that’s more than a book a week! Two at Raithane had read 69 each! At the small primary school of Kumveshwori the child who had read the most books the past year, the teachers told me, was a keen student and a voracious reader. She however was not there to receive her prize; her younger brother accepted it on her behalf. Turns out she had just recently been “sent to Delhi [, India] to work” by her family. She was just 12! That, sadly, is not the exception. Elsewhere, I described the story of the sister of one of our current students at Raithane and her fate in Malaysia as a migrant worker when she was just a 14-year-old girl. I have also described elsewhere the story of “Chotu,” the kid I met in the Qatari jail, who, though he looked no more than 16, at the time I guessed his age to be 19 only because I didn’t think it was possible for a child as young as 16 to end up in Qatar, in the first place, and then in jail…on murder charges! And in yet another post, I described how the poor in Nepal, especially the Dalits, are victims of trafficking. Pete Pattisson, reporting for The Guardian, has discovered again and again how 16-year-old children are sent abroad. Most recently, an article in The Himalayan described trafficking of poor and Dalit children being rampant in the south. The Wikipedia entry Human Tafficking in Nepal is another quite comprehensive source of information about this. One of the solutions to the problem is education. 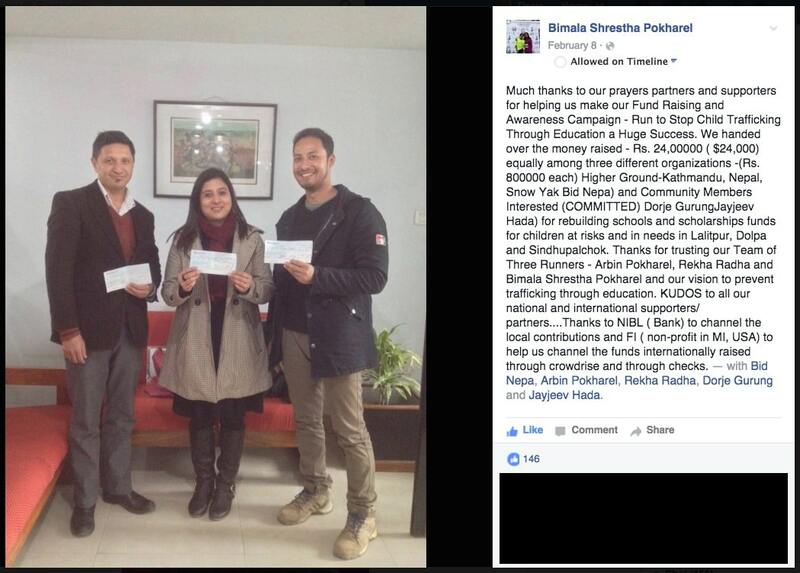 Bimala Shrestha Pokharel, her husband, Arbin Pokharel, and her sister Rekha Radha, a family of runners, have banded together to raise awareness about the issue and to raise funds for the education of vulnerable children through participation at different marathons throughout the next twelve months or so. Back page of the bookmark. Click on the image for the original. Annapurna (50 km), March 1, 2014. Tenzing Hillary Everest Marathon, May 29, 2014. 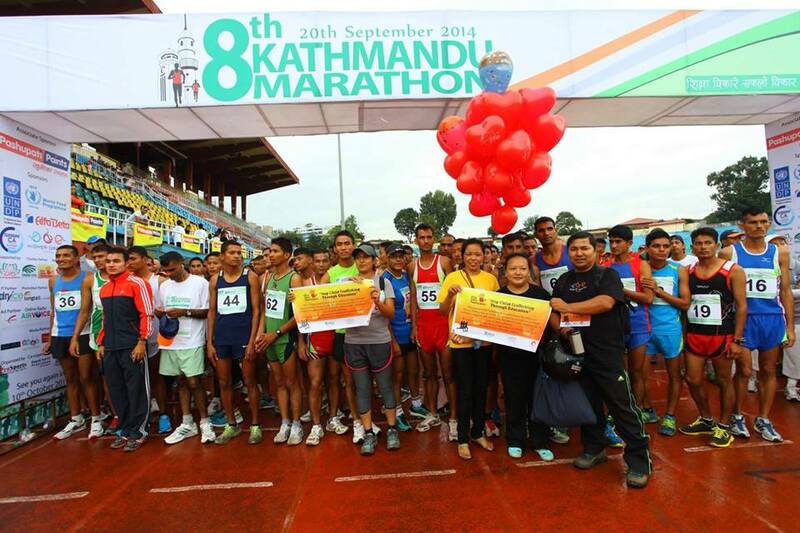 Kathmandu marathon, September 20, 2014. 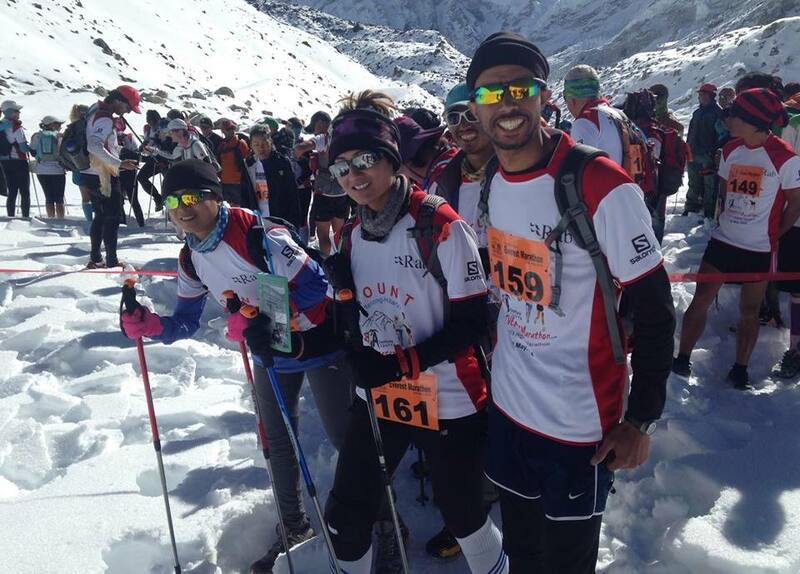 Shivapuri Ultra Run (27 km) on January 3 2015. Mustang multi-day trail race in April 2015. Where does COMMITTED come into this? Bimala and my connection is through our shared belief in education as a preventive measure against a host of issues faced by Nepalese from poor and marginalised societies–trafficking being one of them. Higher Ground’s belief in education prompted them to partly sponsor Bishnu and her sibling’s education, whose story of an uncertain future following her father’s death in Qatar I shared several months ago. Generous donations from people and Higher Ground allowed Bishnu to continue her education. When Bimala approached me about running this campaign to benefit three organisations–Higher Ground, COMMITTED and Snow Yak–I was fully supportive of her plans, not only because of the cause, but also because I discovered the third organisation would be no other than that being run by Binod Shahi, the “Sir of Dolpo” I had heard so much about and had wanted to meet! Binod is a young man driven by a dream to change and empower, through education, the people of Dolpo, a district West of Mustang, where I come from. He has been at it for the last 9 years, a number of those years all by himself! Watch the YouTube video below to find out more about this remarkable young man, which, incidentally, was also my first introduction to him, having been made aware of him by a school friend and fellow nepalese UWC graduate. What do you do or what can you do? There are a number of ways you can support this campaign. 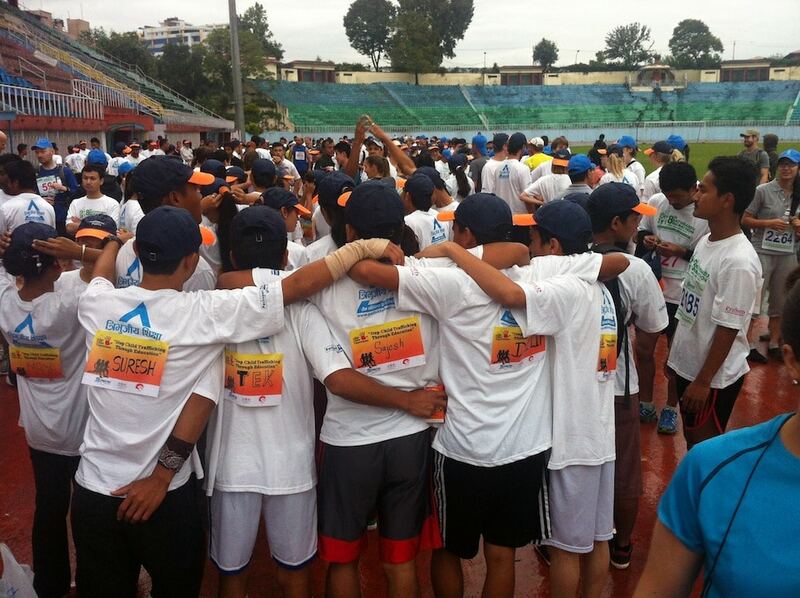 If you are abroad, donate to the cause here: Run to Stop…Child Trafficking. All the funds collected over the course of the coming year will be divided equally among the three organisations for use in education programs benefiting vulnerable children. However, Binod will only be accepting donation made by Nepalese nationals. What that means is that, should donations by Nepalese nationals–in-country or abroad–amount to less than a third of the take, then he will be happy to take whatever falls in his organisation’s share. 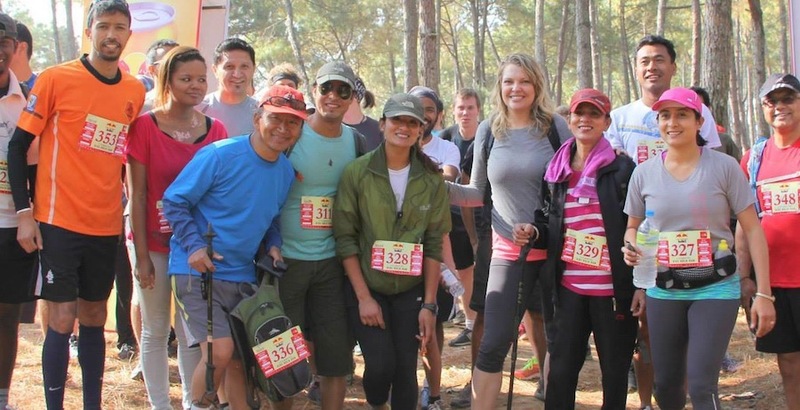 Since publishing the page, Bimala, Arbin and Rekha have already participated in three runs. 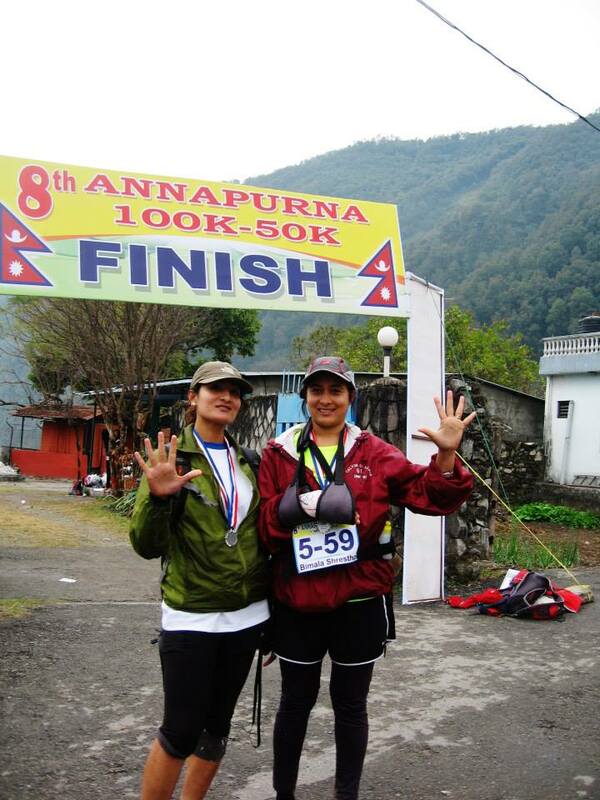 Annapurna (50 km), March 1, 2014: the dynamic duo sisters of Bimala and Rekha completed this race. In spite of some difficulties and inconveniences both the sisters faced, they persevered! Hattiban 13.5 K – Chamapadevi challenge, March 22, 2014. Bimala, Rekha and Arbin were joined by Jayjeev, Binod, and myself, and a host of other friends and well-wishers. In addition to running the course, the team also ran a stall selling coffee and baked goods from Higher Ground Bakery to raise funds. All the profits went to the campaign. 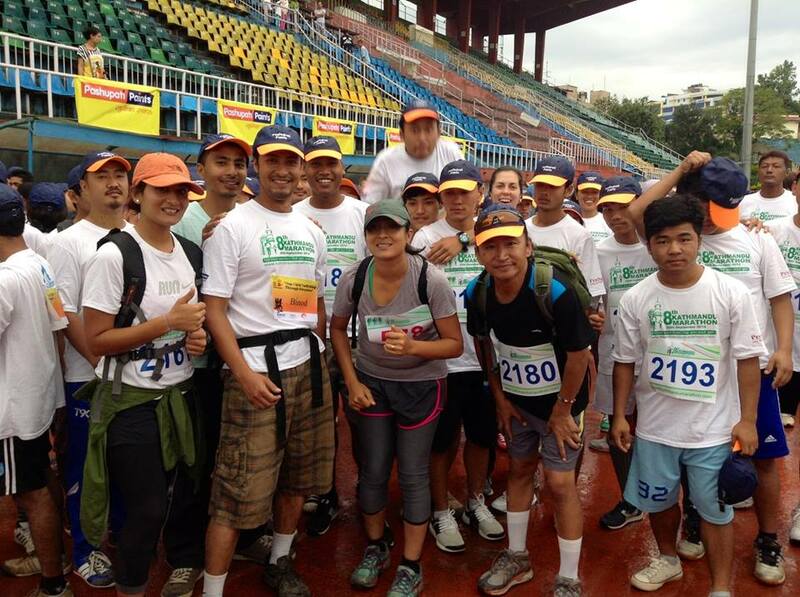 Bimala at the starting line promoting our campaign just before taking off for her half-marathon. 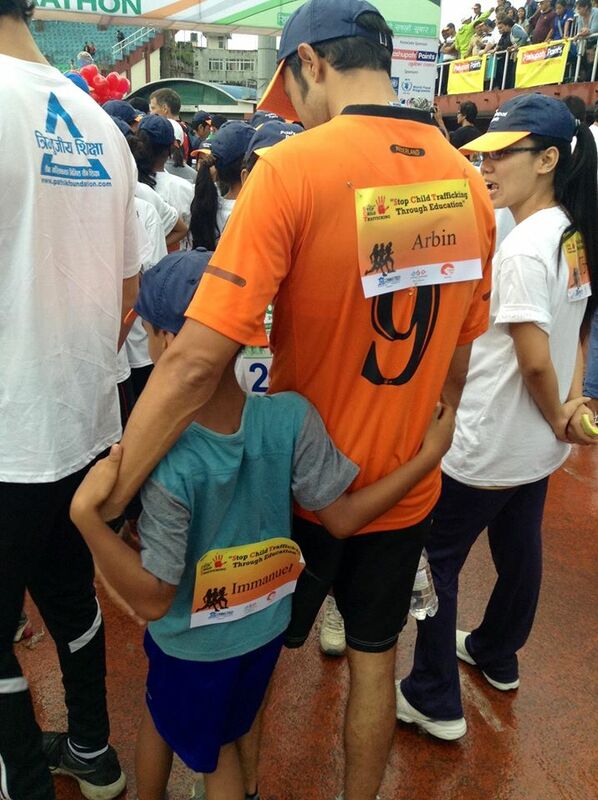 Arbin and Immanuel, his son, showing their better side! Here we are, from the left, Rekha, Binod, Bimala and me. Some of the 100+ volunteers showing me their better side! Next run Red Fox Yeti Run at Godavari on September 27. I’ll be there with the trio. 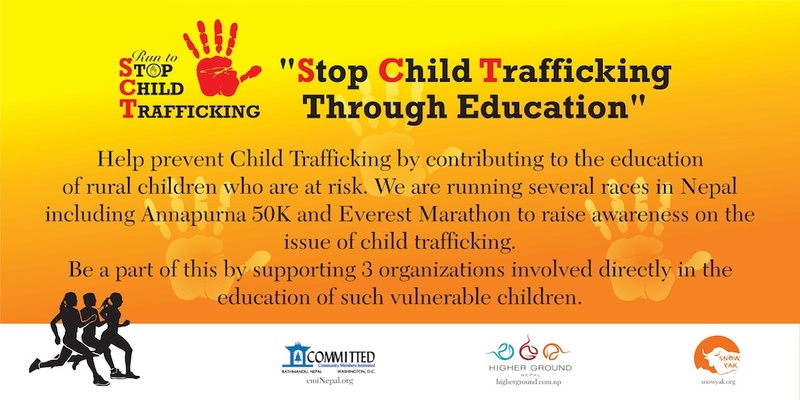 Come join us; come run with us; come Run to Stop Child Trafficking! But young girls in Nepal, like the one in the image below, were very very vulnerable to begin with. They are now even more so following the earthquake. How we take care of them as a nation will determine, as far as I am concerned, our worth as a people! Thank you everyone who contributed in one way or another and supported us in this year-long campaign! Thank you to all the donors to and supporters of this awareness and fundraising campaign! The funds raised will go a long way in helping the community of Thangpalkot. COMMITTED was involved in emergency relief of earthquake victims in the VDC and elsewhere (click here, here and here for details), and continues to be involved in the rehabilitation of school children and in school reconstruction work (click here, here and here for details). However, we have yet to raise sufficient funds for the reconstruction of the five school in Thangpalkot, for which we could use your help. COMMITTED’s share of funds raised through this campaign was allocated to the reconstruction of Taltuleshwori Primary School in Thangpalkot. The reconstruction is almost complete. The children have already moved our of the Temporary Learning Center (TLC) and into very airy and bright classrooms!